2019 marks a special anniversary for Take That. To celebrate their milestone, the band have announced that they are performing all their much loved greatest hits live in Arena Birmingham. The concert will see Take That joined by special guest Rick Astley. Ahead of the Album release, fans will get a taste of what’s to come when the band release ‘Pray (Odyssey Version)’ on 21st September to coincide with their UK Tour announcement. www.glos.info have secured a pair of tickets to see Take That Greatest Hits Live 2019 at Arena Birmingham on Monday 13th May 2019. Enter below for your chance to WIN this fantastic prize!!! Question: What anniversary are Take That celebrating in 2019? Entries must be received before midnight on Sunday, 21st April 2019. Please provide name and address as proof will be required to collect the tickets. Tickets must be collected from the www.glos.info shop in Cheltenham and photos may be taken for promotional purposes. The winners will be drawn at random on Monday 22nd April 2019 and will be contacted via email. 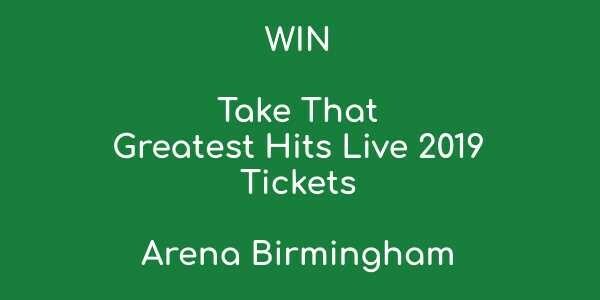 The winner will win a pair of tickets for Take That Greatest Hits Live 2019 tour at Arena Birmingham on Monday 13th May 2019.